Firewalking is an ancient ritual that has been practiced for thousands of years by various cultures. 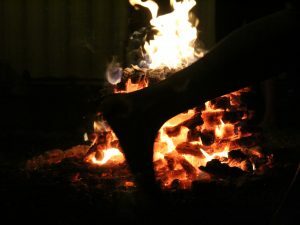 The first firewalk dates back to 1200 BC in India during the Iron Age. The walk was a competition between 2 Brahmin priests. Africa also has a long history of firewalking and fire dancing. The African-born Hindus regularly walk on fire for religious festivals and the !Kung Bushman of the Kalahari Desert have firewalked since their tribal origins in powerful healing ceremonies. In Bali, it is the young girls who dance in the fire as the Balinese believe the gods to be “children of the people.” In India, Tibet, Sri Lanka, China, Japan and Argentina, people dance and walk joylessly and devotionally across the fire. In the Hindu fire ceremony, Agni Hotra, fire is used to purify the physical and spiritual atmosphere. In Peru, it is used to spiritually uplift participants in the ceremony. In the 1970’s Motivational Speaker, Peggy Dylan collaborated with Firewalk Instructor, Tolly Burkan to catapult firewalking into an inspirational movement in the US, Europe, Asia and South America. Before this time, Tolly had kept his firewalking practices a secret. But Peggy’s desire was to bring it to the world for global transformation. Both continue to hold workshops and retreats today. All around the world fire is used to rites of passage, heal, renew and awaken spiritual potential.